INTERESTED IN BECOMING A MEMBER OF THE FCVFD? 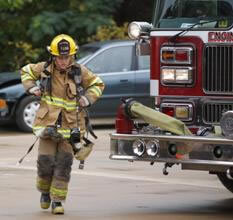 The fire and rescue service is one of the most diverse and challenging professions today. It is the diversity that inspires most men and women to enter the service - both as volunteers and career employees. Imagine having to train to prepare yourself to cope with situations which range from building fires to childbirth to hazardous chemical spills to heart attacks, and almost any imaginable emergency situation in between. This diversity is coupled with the fact that these skills may be needed at any time of day, seven days a week, in any kind of weather, and very often under potentially stressful and emotional circumstances. These challenges contribute to our profession being personally rewarding. As volunteers, we are here for two basic purposes. The first is to prevent fires or medical emergencies from occurring. This is achieved through fire prevention, health maintenance education, inspections, fire safety education, and code enforcement programs. Secondly, we are here to prepare ourselves to control fire or medical emergencies, should prevention fail. This is done through education, training, pre-incident planning, more training, state-of-the-art equipment, and more training. We are a paramilitary profession working in a "hurry up and wait" environment. This business is not for everyone. You need more than just a desire to help people. You need courage and dedication, assertiveness, and a willingness to learn new skills and face new challenges. And you need to have the time, for training sessions, meetings, emergency calls, maintenance of equipment, and other duties. 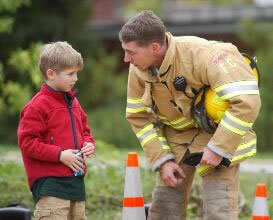 The fire and rescue service is not for the meek or timid or for those who lose control during times of crises. Our service is one which calls on its members to perform hot, sweaty, dirty, and strenuous work, often in uncertain and hazardous environments. 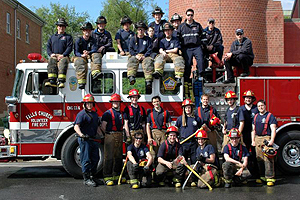 The Falls Church Volunteer Fire Department participates in a wide variety of activities within the Falls Church and DC Metro area. In addition to responding to emergency incidents, we perform public education demonstrations, fund raising activities, public event standbys, apparatus maintenance, and many other support functions. Some of the events our members and apparatus have supported include the Marine Corps Marathon, Presidential Inauguration, Independence Day on the Mall, local varsity football games, and Falls Church Memorial Day festivities. Our members participate in numerous regional fire schools, state certification courses, college-level courses, and National Fire Academy courses. Most expenses incurred by members while attending training are reimbursed. The Department policy on training reimbursement can be viewed under Operating Guidelines. The FCVFD has two categories of membership available, Regular and Administrative. People interested in being a Regular member must be physically and mentally capable of performing firefighting and EMS duties during all types of weather and circumstances. Administrative membership is intended for citizens who are interested in assisting our Department, but lack the physical ability or the desire to participate in emergency operations. Administrative members assist in a variety of Department functions, such as fundraising, recordkeeping, and fire prevention. We also permit election of Administrative members to certain offices in the Department. If you feel you have what it takes to meet the challenges of our business, we welcome you to join us. If you are interested in learning more about the Falls Church Volunteer Fire Department, simply fill out the form below and click "submit". A member of our Membership Committee will contact you to discuss volunteer opportunities with the department.